Thinking that the “social” in social media marketing is all about your relationship with consumers is constraining. Rethinking the role of other relationships can dramatically improve the effectiveness of those very marketing efforts designed to engage your target customers. While social channels facilitate new ways of tapping into “partners” and as the line between personal and professional relationships has blurred, it is important to view business relations in a new—and yes, more social—light. In this ad Southern Gulf Electric uses the Kohler brand to bolster its credibility. When marketing shifted online, the value in partner marketing came largely from links on a partner website. Social media has created new opportunities for partner marketing and at the same time lowered barriers to forging partnerships, small and large, formal and informal. Co-brand with a partner to raise the profile of your campaign. You can provide additional exposure for the partner brand while they lend their brand equity to your marketing. If you have a promotional tab on your Facebook page, for example, consider incorporating partners into the design and messaging. Get partners to donate prizes for a contest or giveaway. This is often one of the first suggestions I make to our clients who are running promotions with prizes. Partners can provide access to prizes you might not otherwise be able to offer, both material and experiential. And often, companies have the ability to provide “in-kind” sponsorship (i.e., offering goods or services) when cash budgets are limited, so get creative. This contest, developed by a client using the Strutta platform, is a good example of how to bring partners into your campaign. 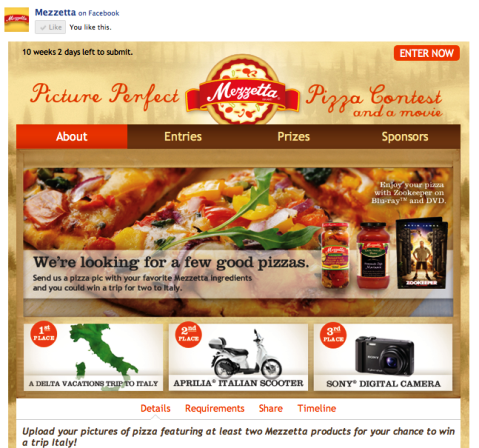 In the Mezzetta example above, multiple partners contributed prizes and in return received prominent exposure on the online contest. This reduced the cost to Mezzetta while providing a “halo effect” for all those associated with the campaign. This gives the appearance of being a much larger, integrated marketing program in the eyes of the consumer. 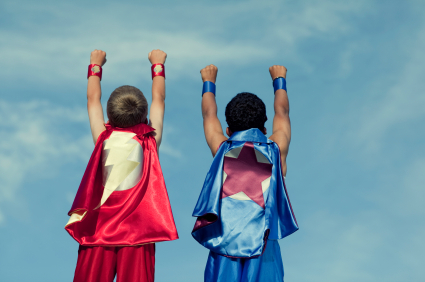 Tap into partners’ social channels to amplify your message. Even if you don’t have a comprehensive partner marketing plan in place, ask partners to retweet (it helps if you give them an @ mention) or to cross-post on Facebook to give your communications an extra boost. If you have an even deeper relationship, perhaps you can get mentioned in a blog post or included in an email newsletter. But don’t rely on serendipity when it comes to partners helping to spread the word. While you may be concerned about keeping communication genuine, there is nothing wrong with asking someone to share on your behalf. While the above is a high-profile example, this type of co-marketing on social channels can greatly benefit small businesses that can combine forces to increase their reach. You might be wondering what differentiates a partner from merely a casual connection. Or where you should draw the distinction between a friend and a business contact. The answer: Don’t bother. Nurture your connections to create partnerships. Image source: iStockPhoto. I’ve used the term “partner” in this article to encompass everything from a fully integrated co-marketing relationship to a more casual request to share a tweet or a post. One of the great things about social channels like Twitter and Facebook is that they make low-investment partnerships much easier. While some companies are rightfully protective of what they publish, it’s still a lot easier to get mentioned in a tweet than it is to orchestrate a co-branded advertising campaign. I can anticipate the comments already, so let me acknowledge that not all relationships are created equal. Just because it has become easier to connect online does not necessarily mean that our digital relationships are equivalent to those built up over years of personal interaction. And I certainly don’t want to imply that there should be any undue expectation put on a relationship that is based on nothing more than the act of following someone on a social network. At the same time, I know firsthand that social media has enabled me to make connections with people I most likely never would have met in the traditional offline world. Or it certainly would have taken a lot more to make that connection. However, making a connection is only the first step. Building a relationship, no matter what the medium, still requires genuine effort. Here again, social media has facilitated a regular opportunity to interact, even if not on a deep level, and thus to build rapport. Whether online or off, relationships and the ability to make the most of them rely on the principle of social capital. It has just become much easier to build social capital online (i.e., “Likes” or followers) and to use those resources to facilitate partnerships. Yet when it comes to approaching a potential partner or asking a favor, common etiquette and principles of reciprocity still apply. Use social channels to create connections you might not otherwise be able to make. Use those same tools to develop relationships with an equal level of thoughtfulness you would put into a face-to-face interaction. Don’t assume that those in your social network will automatically support your marketing efforts. Don’t be afraid to ask for support, assuming you have a genuine relationship. Ask nicely and perhaps offer something in return. Wherever possible, look for opportunities to involve partners more deeply in your social media campaigns. What do you think? What’s your business doing to improve the effectiveness of your marketing efforts? Leave your questions and comments in the box below.